Outrigger Fiji Beach Resort: More Than The Usual Resort Stay - Holy Smithereens! 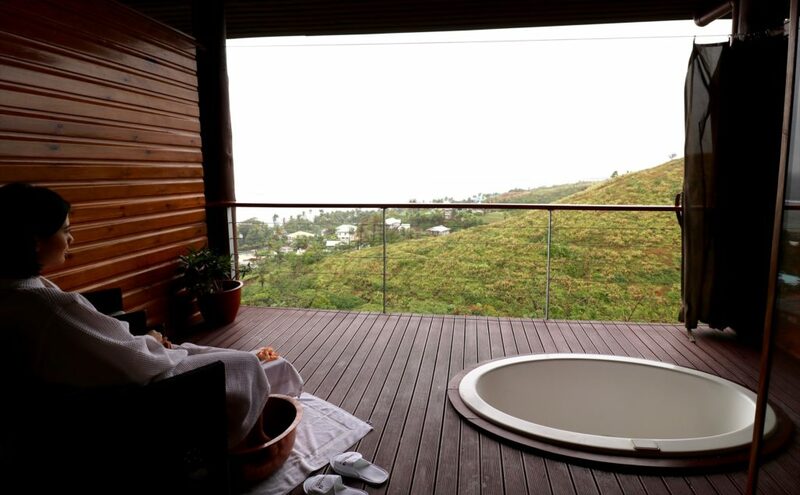 Outrigger Fiji Resort – Lush and Green. The view from my room. There’s something about solo travel that makes one more receptive and open to new experiences. When you’re travelling with someone else, you tend to cater to your companion’s needs and interests, no matter how similar you are. So when I travelled to Fiji alone, I found myself opening up to new experiences. 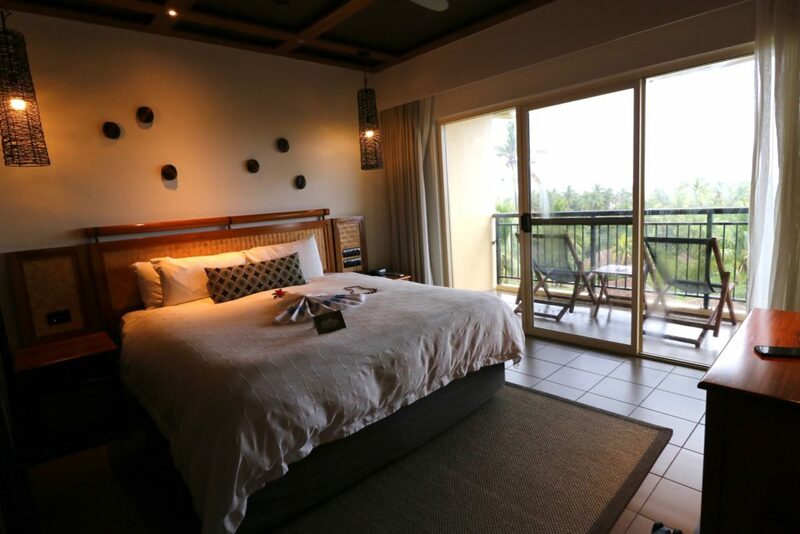 And the Outrigger Fiji Resort couldn’t have been the more perfect venue for this solo traveller looking to find herself, and also get to know Fijian hospitality and culture. The skies were grey when I arrived in Fiji. But everyone was in high spirits. “We needed this rain!”, Kapil says gratefully with a smile. 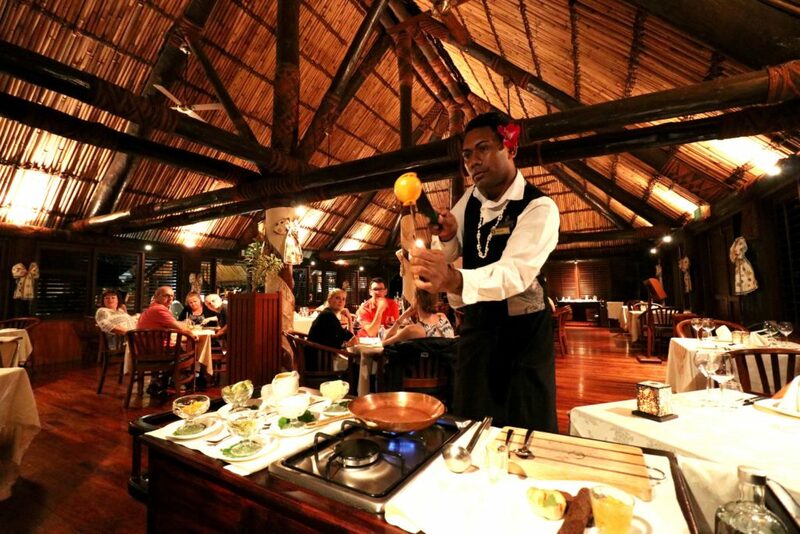 Kapil is Outrigger Fiji’s driver and has been working one and a half years with the resort. He tells me that today was the first rain they had in a very long time. The drive from Nadi airport to Outrigger Fiji is about 80 kilometres and takes about an hour. The drive was very scenic, and I got to see that Fiji actually has equal amounts of mountains, forests, and the sea. Talk about being well-rounded! Kapil gives me an educational background on Fiji – from its flora and fauna, to the harmonious relationship among Fiji’s main people – the Indigenous Fijians , the Indo-Fijians ( Fijians of Indian descent who were brought from India by the British from 1879-1916 to work on the sugarcane fields), and the Chinese-Fijians. 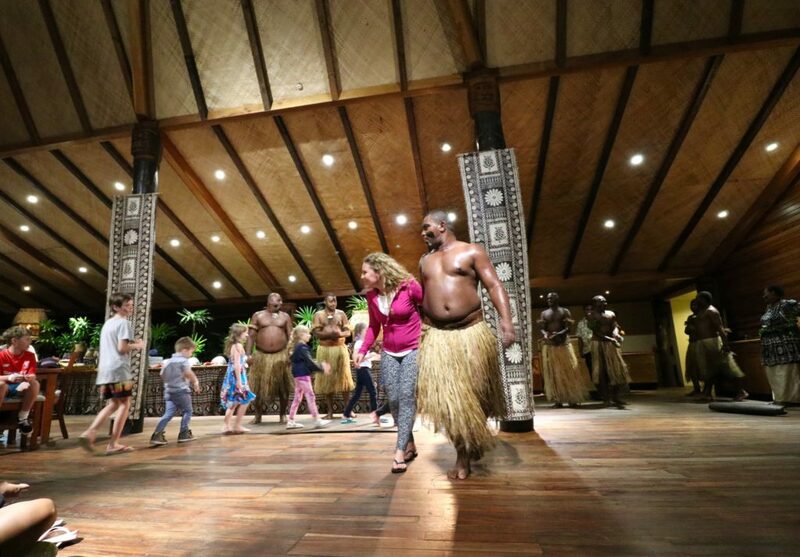 I was welcomed in true Fijian style – warm, with a lot of smiles and Bula’s! I was then introduced to Koroi, the assigned butler for my stay. Koroi then ushers me to my room, an Ocean Breeze One Bedroom Suite. The suite is extremely spacious, measuring 936 square feet / 87 square metres. The living room is separate from the bedroom, and has its own balcony as well. The King sized bed is quite soft (too soft for me) but I can imagine others will find it ideal. Just like the living room, the bedroom has its own tv and balcony with chairs. 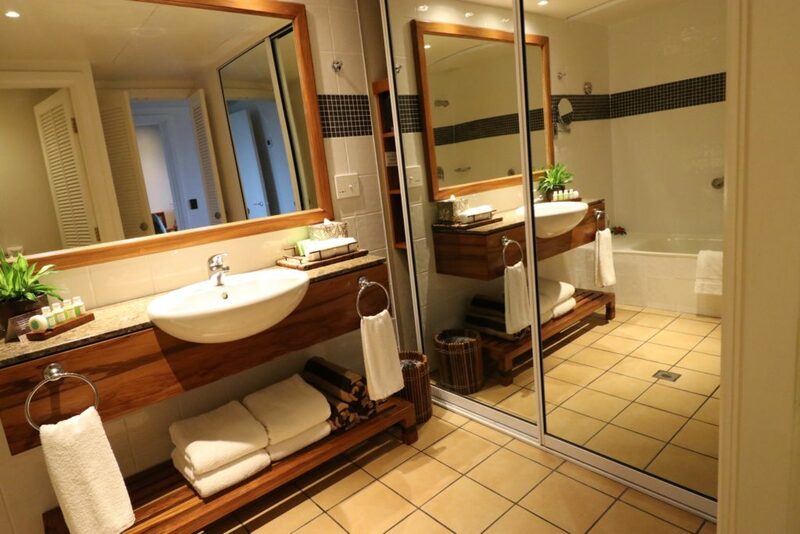 The bathroom’s closet is also the bedroom’s closet, so if you have both closet doors open, the bathroom transforms into that trendy “see through” style that is famous among hotels. Though the toilet has a separate area, the bathtub also acts as shower. Toiletries are from Tapa Spa. The scent combination is amazing – Coconut oil and passionflower. I found the formula to be extremely mild though. So this is good news for sensitive skin types. 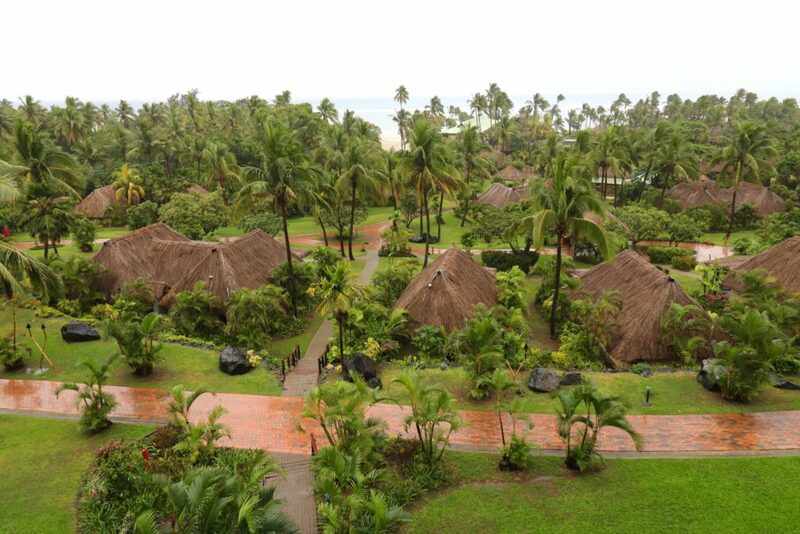 Wifi is complimentary , and as it rained throughout my entire stay at the Outrigger Fiji, the weather was quite cool. Especially in the evenings, so I had peaceful and uninterrupted sleeps during my stay. 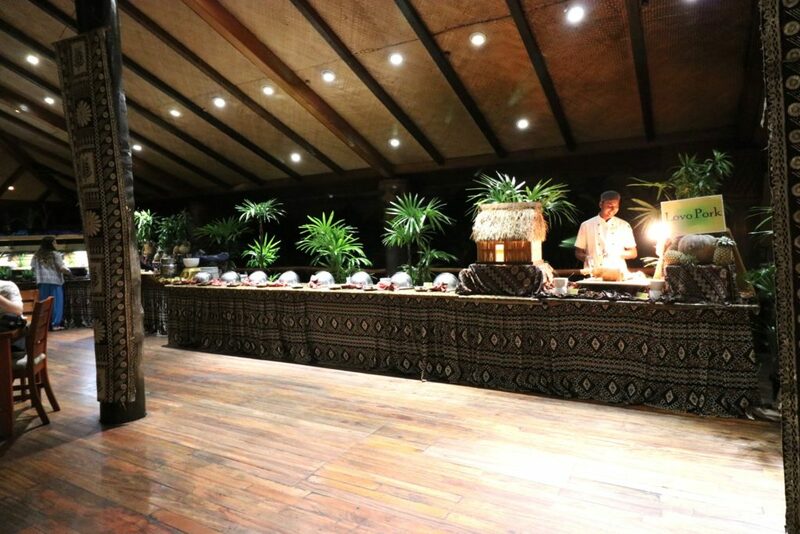 On my first night, I had the chance to dine at Ivi Restaurant, Outrigger Fiji’s formal dining option for adults (kids above 13 ok). All wood and high ceiling, I was really impressed by Ivi’s interiors. The ambience was also quiet, and a live guitar quartet band later performed for diners. The price is quite reasonable for a formal dining restaurant. 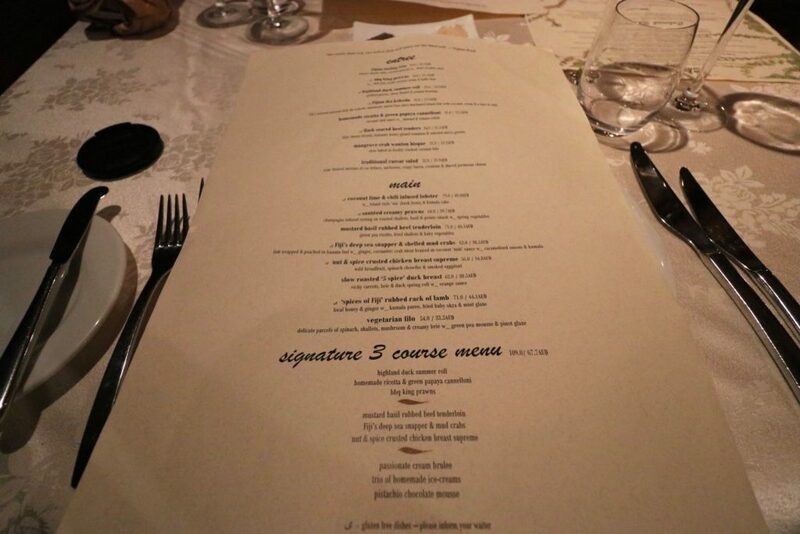 Main dishes start at AUD 33.50 and their signature three-course menu is AUD 67.70 / person. If I thought the interiors of Ivi Restaurant were impressive, I was even more impressed with how they served the food, not to mention the food itself. We started with the traditional Fijian Kokoda or raw fish salad. Now, I love seafood but not a big fan of raw fish. But because the fish is marinated overnight, it has acquired a firm texture (definitely not gummy or mushy) and because it is coconut based, it’s not very acidic or sour. The Fijian Ika Kokoda was made right next to our table. Our waiter brought out a tray with all the components of the Fijian Kokoda and demonstrated how it’s done. The Barbecued King Prawns that I ordered for my starter were amazing. It had a sweet, barbecued and glazed finish. I’m also glad it was cooked with the shells, as it retained a lot of the smokey flavour. 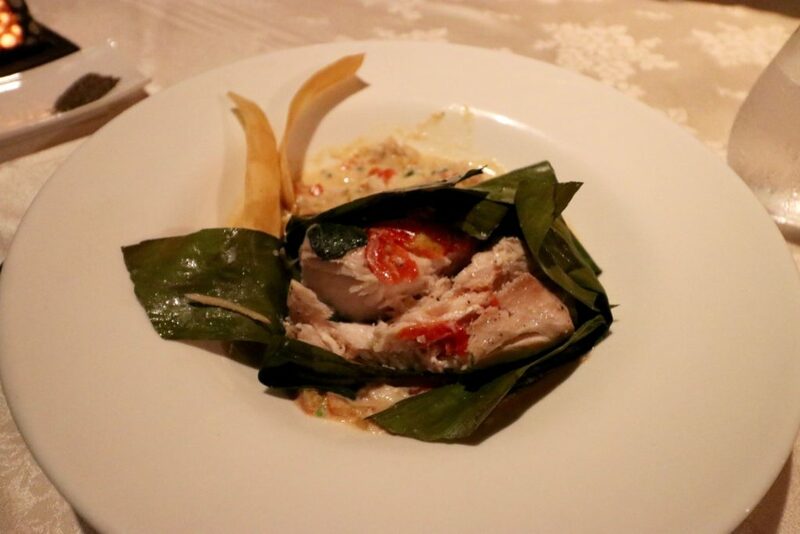 My main dish was Deep Sea Snapper, which came wrapped in banana leaves. Surroundong it was flaked mud crab with coconut sauce. It was my absolute favourite meal – the combination of the fish and crab with the coconut sauce was light but satisfying enough. But the main event of our dinner was yet to come. The dessert was definitely the star of the night. Salote, Outrigger Fiji Resort’s Guest Service Manager, suggested her favourite, “In The Tropics”, and soon I found out why this was a favourite. 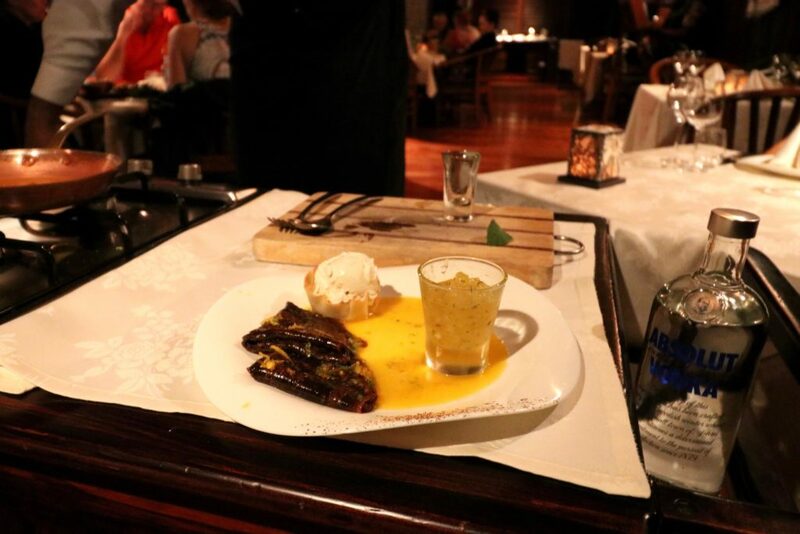 The menu description of In The Tropics is: chocolate crepe suzette of flambeed orange with pineapple mint compote and vanilla ice cream. Sounds yum enough, right? 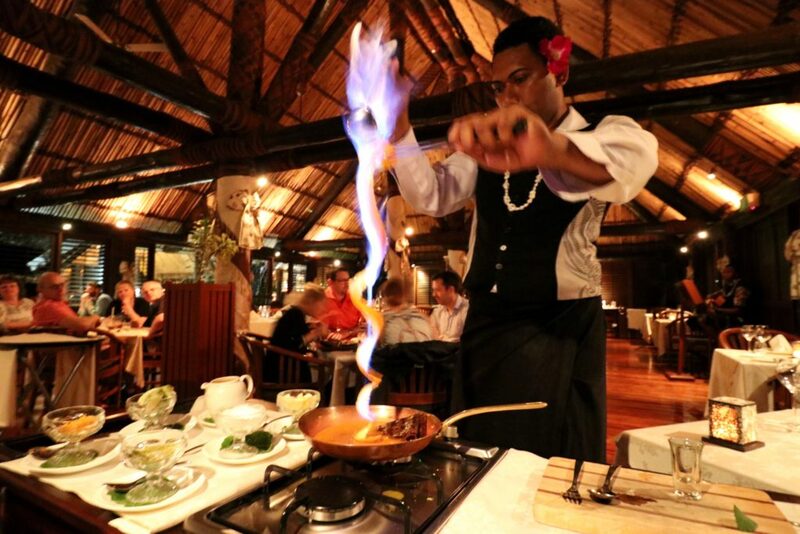 But in Outrigger Fiji, they take things up to a different level. All eyes were soon on our table as our waiter, Moses, skewered an orange, and expertly peeled it with a long knife (almost like a small sabre). Electric Orange Peel! The magic happens. And Moses really put on a show as he poured Cointreau down the orange peel, which promptly ignited in dancing blue flames. In the Tropics – the best dessert in Ivi Restaurant! Now In The Tropics isn’t just all show and presentation. It was absolutely divine. The chocolate crepes were the right consistency – not too thick or thin, and the orange compote really combined well with chocolate. And the vanilla ice cream was so thick and rich – the kind that almost doesn’t melt! I normally don’t finish my desserts, but you imagine that the plate was left almost sparkling clean. This is what I love about Outrigger Fiji. It’s not just all about indulgence. 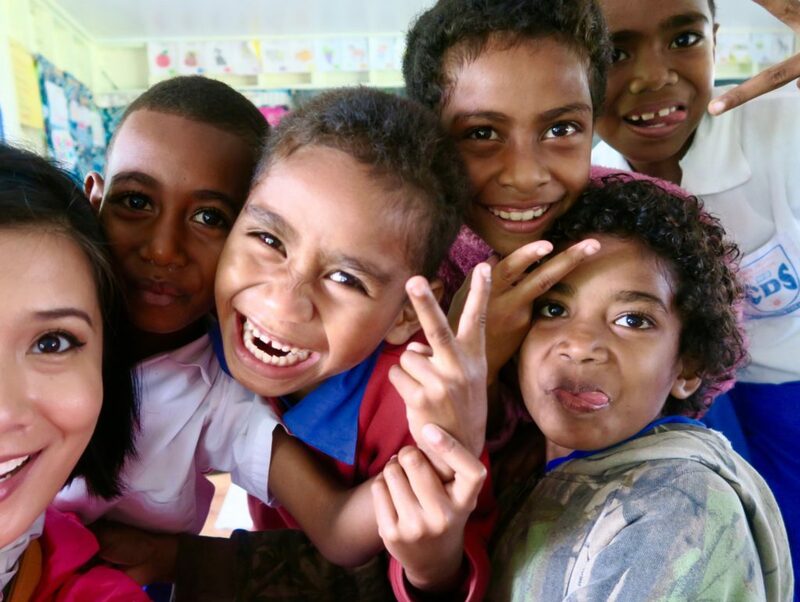 Outrigger Fiji Resort gives back to the local community and it is definitely evident. Every Tuesdays and Thursdays, guests of Outrigger Fiji can experience this on-going community project at Conua District School. This project is a perfect example of how one man can make a change. This all started last year, when Outrigger Fiji’s General Manager Peter Hopgood paid a visit to Conua School on a rainy day. While they were holding a meeting, Mr. Hopgood couldn’t help notice water trickling down from the meeting room’s ceiling. He then thought of a way to help. This small thought brought about a new meeting hall made of concrete that Outrigger Fiji built. 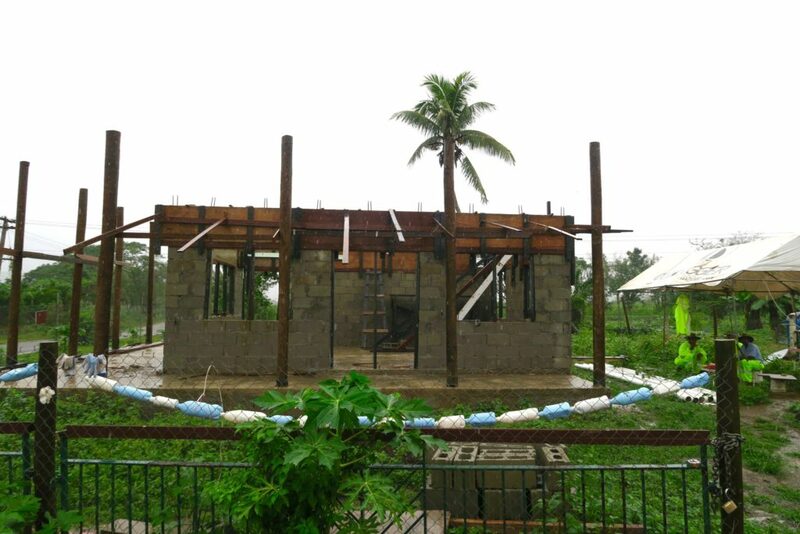 This meeting hall is now completely finished, and Outrigger is now building a new project, an entirely new Kindergarten for Conua. This is the current Kindergarten. It’s not bad, it’s made out of wood, and on a rainy day, the floor is damp and the kids could definitely enjoy more with a concrete structure. When it’s not raining, guests usually take part in the actual building of the Kindergarten – be it painting, sanding, or a little bit of woodwork. But as it was heavily raining when we visited, this meant we got to interact with the students more. We went from class to class, and it was so much fun getting to know them. 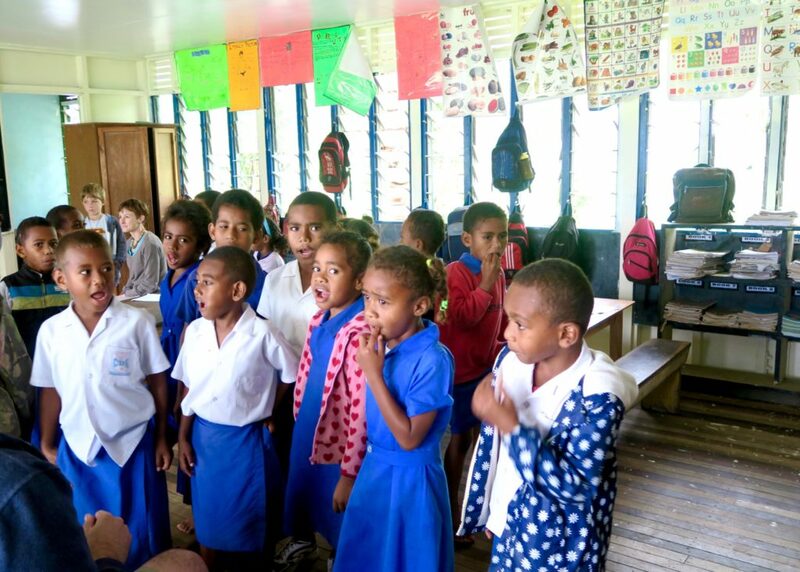 It was so endearing to be amongst the Fijian school children. Most of them take the bus to school, a lot of them walk, and a few even go by horse. And unlike myself when I was their age, these kids were SO HAPPY to be in school. They just finished their exams (it was the last week before school holidays), and they were all beaming with pride as they showed me their assessments with impressive scores. A couple of the classes sang for us. And oh how they sang! It was an all-out, singing-from-the-bottom-of-their-hearts kind of singing. You will see this in the video. There is no way you cannot smile when you see this photo. Happy Fijian kids! I highly recommend joining this activity if you are at the Outrigger Fiji. It provides awareness to guests – the students are not in a destitute condition but they definitely can improve. 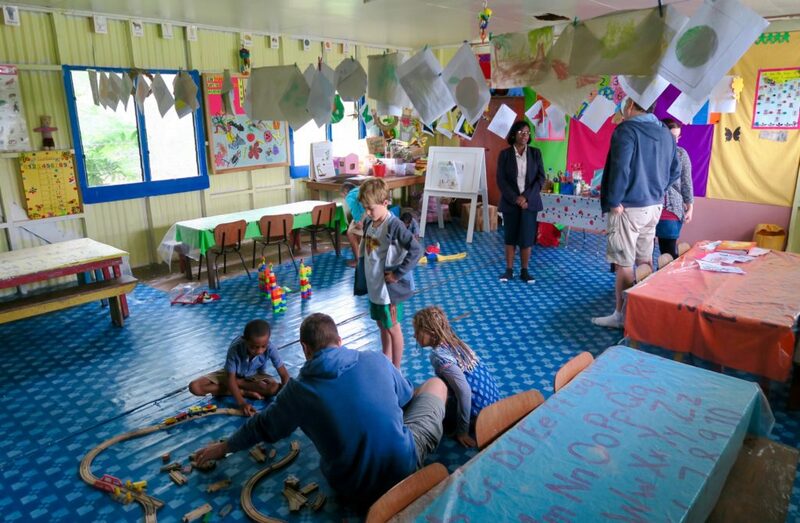 There was a young family of three children in my group that went on this activity and it was great to see the kids not just interacting with the local schoolchildren but also be aware of how schools are in Fiji. It will give them a sense of appreciation, gratefulness, and maybe even a desire to help. This activity costs FJD 100.00 (approx AUD 63.00) per adult and FJD 60.00 per child. It includes a light packed lunch and a scenic drive around Sigatoka. The Outrigger Fiji Resort, which by the way, was formerly known as Outrigger on the Lagoon, measures over 40 acres. So its own grounds for a fire walking ceremony. I was able to witness it one rainy afternoon. (Rain or shine, they go ahead with it!). Only people from a certain village can perform on a fire walking ceremony and it is headed by a priest. Before they began, they started with chantings and prayers in preparation for the task. And one by one, everyone in the group walked with their bare feet over hot stones. 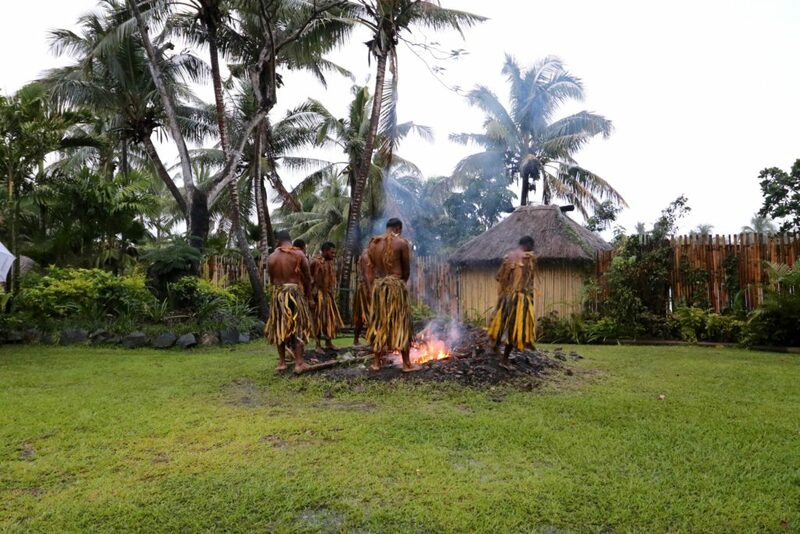 Legend has it that firewalking in Fiji began in the island of Beqa over 500 years ago. 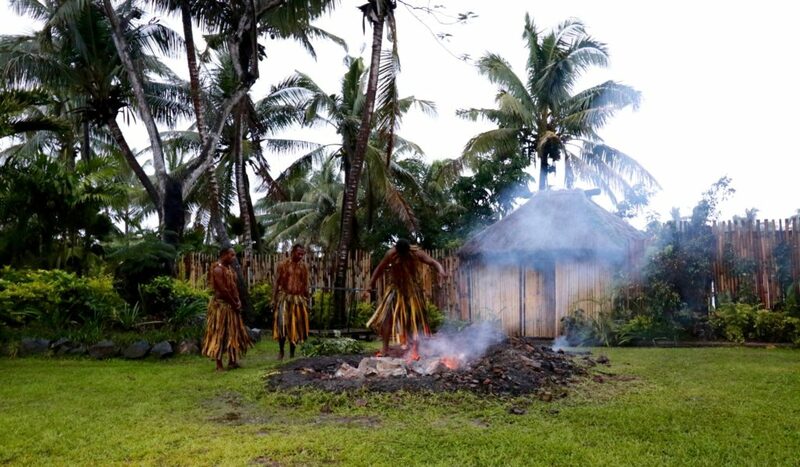 The men of that island were given the gift of being able to walk on fire by an eel, in exchange for its life. And though the rain was pouring tremendously during the ceremony, it was still a very fascinating ceremony to observe. 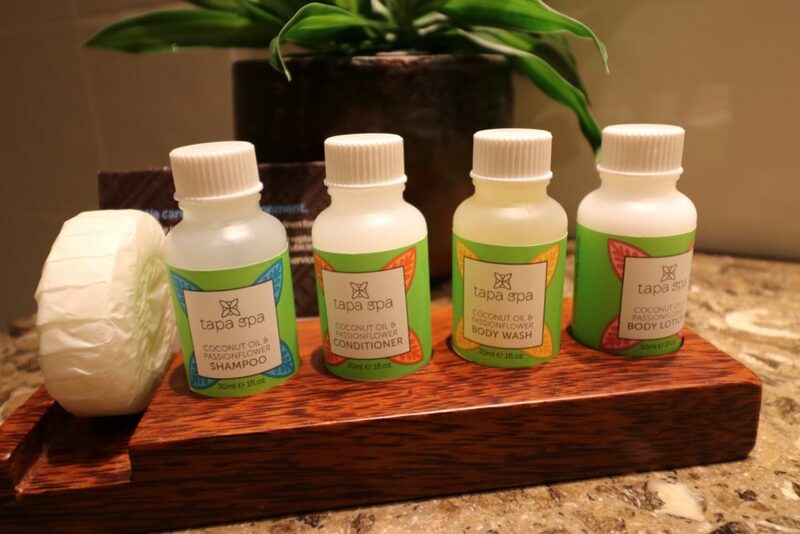 There’s a balance of culture and indulgence in my stay at the Outrigger. I had time to squeeze in a one hour and a half treatment. I had the Signature Bebe Vakaviti Massage treatment. It was relaxing but also revitalising as it involved some use of dry brushing. Along with the Fijian coconut oil used for my massage and the dry brushing, my entire skin all over was baby soft and gleaming when the treatment finished. Bebe in Fijian means butterfly, cocoon or sanctuary. 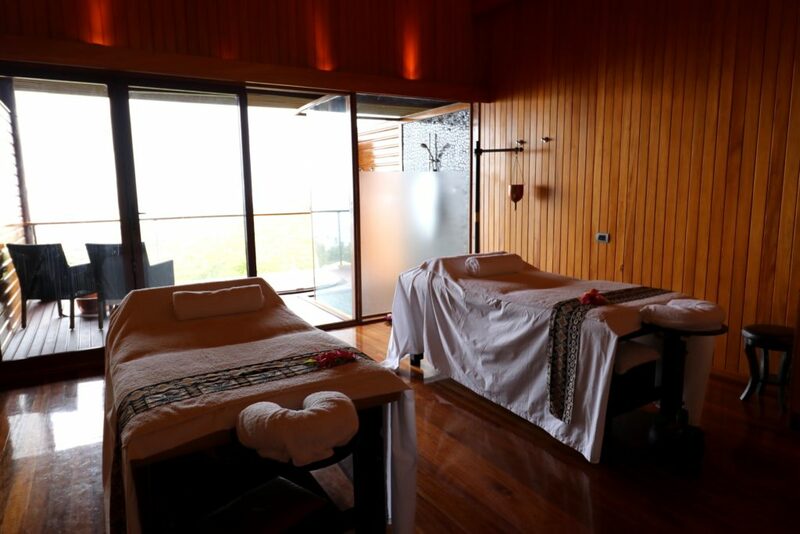 And the location of Bebe Spa really does feel like a sanctuary. 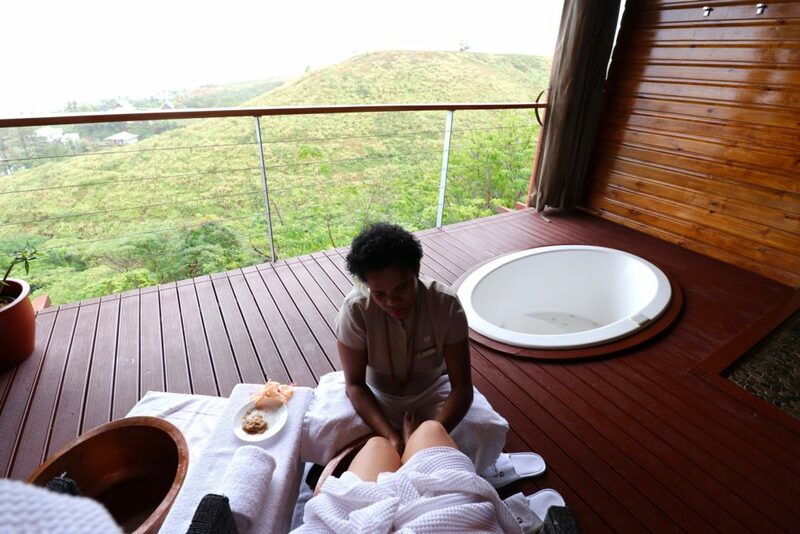 You need to take a buggy to get to Bebe Spa as it is located on a hill overlooking the resort and the rest of Sigatoka. 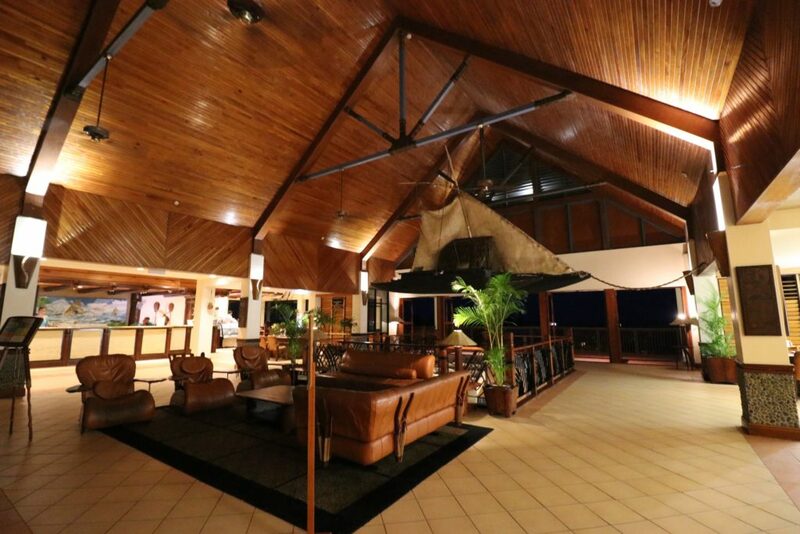 Vale Ni Kana is Outrigger Fiji’s buffet restaurant open for breakfast and dinner. 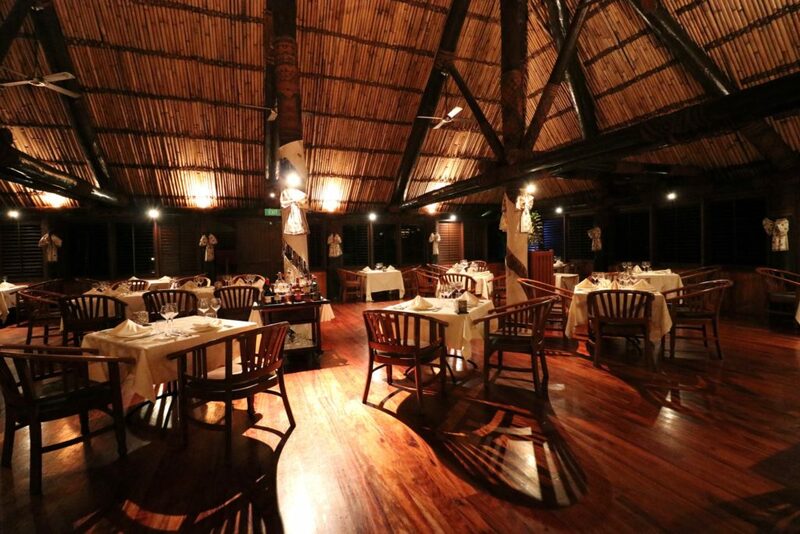 It’s a huge area popular among families, and every night has a theme cuisine. 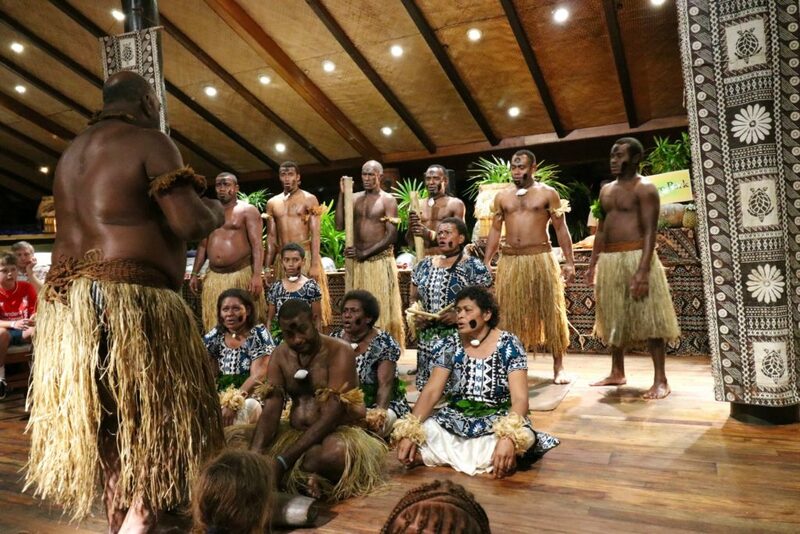 I happen to visit on a Fijian themed night, and along with the great variety of Fijian food available in the buffet, we were also treated to a special cultural presentation. It was such a lively performance, singing and dancing using traditional instruments. You will see samples of this presentation on the video as well. Towards the end of the performance, everyone was encouraged to join the performers. Most guests at the Outrigger Fiji stay for a week or two and it was evident that some of them (especially the children) have enjoyed this experience more than once. It’s great that it gives them something to look forward to. 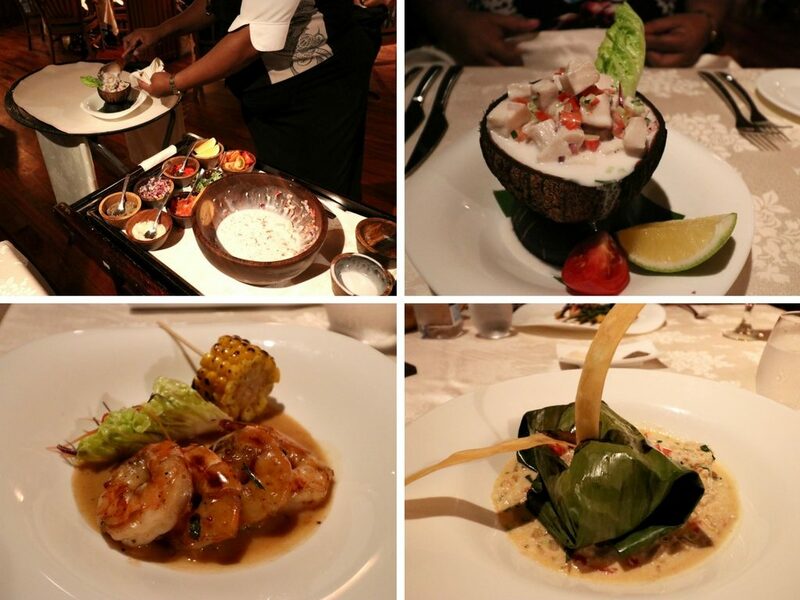 My stay at Outrigger Fiji Resort has been a wonderful mix of cultural exposure, indulgence, and culinary experience. I was able to experience the warmth of Fijian hospitality (it goes beyond Bula! 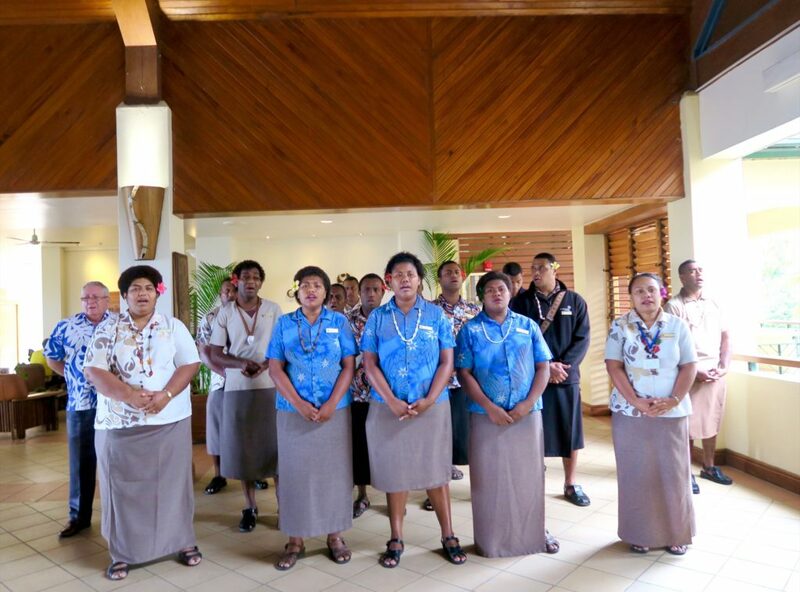 ), but what I found the most touching was when the staff of Outrigger Fiji sang me a farewell song when I checked out. This wasn’t the usual farewell song done in resorts, because the singers were the actual staff- from my butler to the Guest Services Manager, to the General Manager himself. And the song “Isa Lei” (Fijian Farewell song) gave me so much goosebumps as they sang it acapella. This can be found in the latter part of the video. They were amazing singers yes, but I really felt the warmth of their well-wishes for my safe journey and the mixed emotions of good bye. The staff apparently does this to all guests checking out of the resort. Proof of that is my lone self – I was the only person checking out and leaving at that time but still got the lovely farewell song. So you see, it rained the entire time I was in Outrigger Fiji, but my experience wasn’t at all dampened by the weather. With a myriad of activities available within the resort itself and also tours to local villages and the town centre, Outrigger Fiji is perfect for families and couples who are open to richer experiences other than the usual resort stay. Have you been to Fiji before? If not, is it in your destination list? I was a guest of Outrigger Fiji Resort. My stay included all the activities outlined above. All thoughts and opinions are mine alone, there is no obligation for a favourable review. 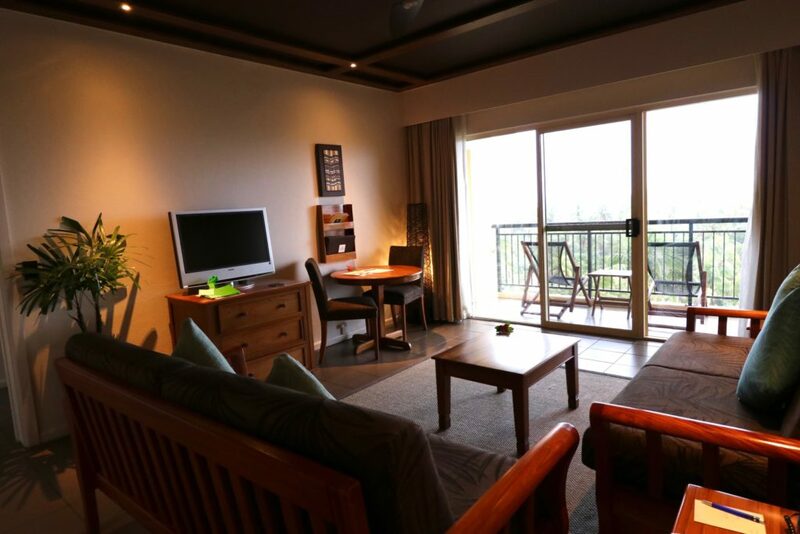 Rates at the Outrigger Fiji Resort start at FJD 467.00 / night on a Deluxe Ocean View (lead-in room) and FJD 795.00/ night onan Ocean Breeze 1 Bedroom Suite (the same as where I stayed, featured above). This excludes taxes and fees. The Community Tourism Project Day Trip at Conua School in Sigatoka costs FJD 100.00 / adult and FJD 60.00 / child. Hi Suze, yes I agree, it would be great if more hotels and resorts develop this kind of interactive community project. It’s amazing how many guests would like to be involved! Hello, our family has stayed at the Outrigger and all of us, hubby, myself and four kids, had a really terrific time. There’s lots to do and the kids are very happy to go to kids club, there was plenty to keep the teens happy too. I loved snorkelling in the lagoon and all the water sports. I’ve also visited alone and had such a lovely relaxing time. Would go back any day! I’ve never been to Fiji but would love to go one day! What a shame about the weather but it looks like there was plenty to keep you occupied! That community tourism project is just wonderful – the tourism industry needs more of that! Hi Sammie, yes the rain was unrelenting the whole time i was there but I can’t believe how much I got up to despite the weather. I can only imagine how much more if the weather was sunny. No wonder most guests stay for over 2 weeks! Yes I agree, the tourism industry, resorts especially, should be more pro-active in providing these outreach programs. Wish to visit it sooner or later.